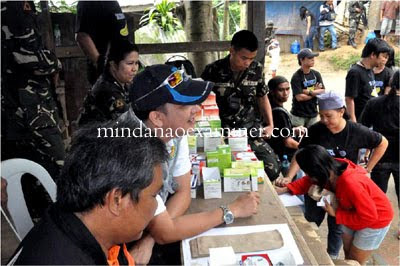 Photos released to the Mindanao Examiner by the 10th Infantry Division show troops conducting a medical mission in Pantukan town in Compostela Valley province in Mindanao where a landslide hit a mining community and killed at least 14 people. Search and retrieval operations have been stopped on Sunday, May 1, 2011. 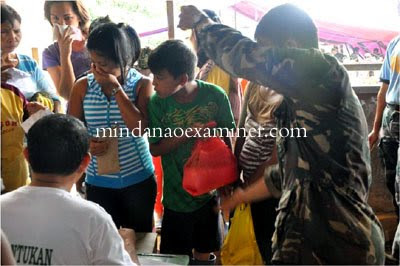 (Text: Mindanao Examiner). 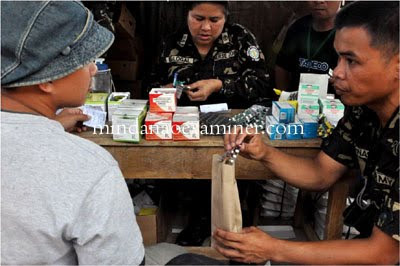 DAVAO CITY, Philippines (Mindanao Examiner / May 1, 2011) – Philippine authorities have finally abandoned Sunday after a week of futile search for possible survivors and bodies buried deep beneath a landslide that hit a mining community in Compostela Valley province, officials said. Officials said a total of 14 bodies had been recovered and that 13 people were rescued since the landslide hit the village of Panganason in Pantukan town on April 22. “We have stopped the rescue and retrieval operations. There is no more we can do. 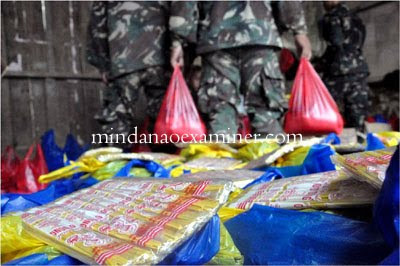 The site is a dangerous now and earth is not stable anymore,” Army Major Rosa Maria Cristina Manuel, a spokesperson for the 10th Infantry Division, told the Mindanao Examiner. She said at least 9 people are still missing. “There are tunnels beneath the mountain, but it’s too dangerous to continue the search for the missing. Every time it rains, rescuers would run for safety for fear that the mountain would again collapse or the rain will trigger another landslide,” Manuel said. 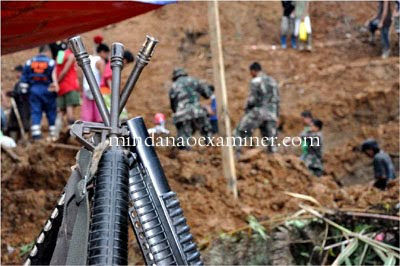 The landslide buried more than a dozen houses at the mountain slope, mostly owned by small-time gold miners. Many of those at the foot of the mountain had been ordered evacuated after fissures were discovered in the mountain.